The sporty Citroen C1 Platinum. Platinum Look Pack - Carlinite Grey roof, Carlinite Grey spoiler, Carlinite Grey door mirros and black side rubbing strips. The Citroen C1 1.0 Platinum is capable of a combined fuel economy of 65.70 mpg, giving it a range of 505 miles on a full 35.00 litres of Petrol. The CO2 emissions are 99 g/km, putting it in enviromental band A. Easy to handle and very much at ease in the city, the C1 offers much more space than you would ever have expected. In terms of safety, the C1 is a front runner in its segment with ABS, ESP and up to 6 airbags available. 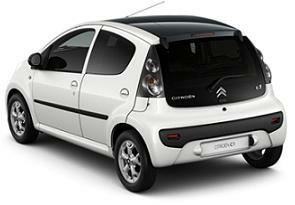 The C1 has the best turning circle in its class. 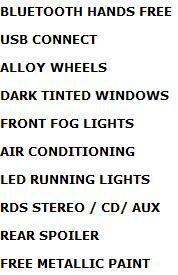 *ALLOY WHEELS - BLUETOOTH AND USB NOW STANDARD ! 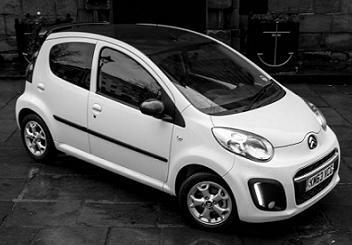 Special Offers Terms: Citroen C1 Platinum 5DR prices are on contract hire or personal car leasing deals over 24 or 36 Months. 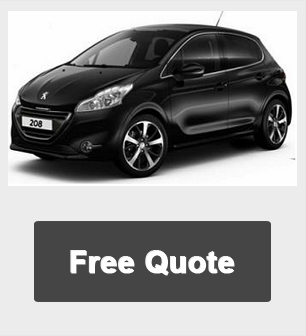 Prices based on 5,000 Miles pa.
*For more information or alternative prices on the Citroen C1 Platinum 5dr cheap business and personal leasing offers please call us on the below number.